LGBTQ people are a gift to the Church and have the potential to revitalize Christianity. As an openly lesbian Episcopal priest and professional advocate for LGBTQ justice, the Reverend Elizabeth Edman has spent her career grappling with the core tenets of her faith. After deep reflection on her tradition, Edman is struck by the realization that her queer identity has taught her more about how to be a good Christian than the church. In Queer Virtue, Edman posits that Christianity, at its scriptural core, incessantly challenges its adherents to rupture false binaries, to “queer” lines that pit people against one another. Thus, Edman asserts that Christianity, far from being hostile to queer people, is itself inherently queer. Arguing from the heart of scripture, she reveals how queering Christianity—that is, disrupting simplistic ways of thinking about self and other—can illuminate contemporary Christian faith. Pushing well past the notion that “Christian love = tolerance,” Edman offers a bold alternative: the recognition that queer people can help Christians better understand their fundamental calling and the creation of sacred space where LGBTQ Christians are seen as gifts to the church. By bringing queer ethics and Christian theology into conversation, Edman also shows how the realities of queer life demand a lived response of high moral caliber—one that resonates with the ethical path laid down by Christianity. Lively and impassioned, Edman proposes that queer experience be celebrated as inherently valuable, ethically virtuous, and illuminating the sacred. 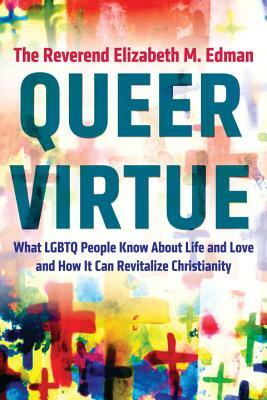 A rich and nuanced exploration, Queer Virtue mines the depths of Christianity’s history, mission, and core theological premises to call all Christians to a more authentic and robust understanding of their faith. The Reverend Elizabeth M. Edman is an Episcopal priest and a political strategist who has been expanding people’s understanding of faith and sexuality for over twenty-five years. She has worked on the most pressing contemporary issues at the intersection of religion and sexuality, serving as an inner-city hospital chaplain to people with HIV/AIDS from 1989 to 1995 and helping to craft political and communications strategies for marriage-equality efforts. She lives in New York City.